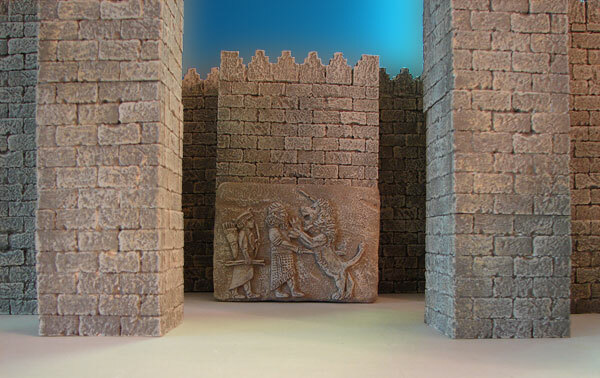 This miniature replica is of Ashurbanipal, King of Assyria, from his palace at his ancient capital, Nineveh. His Biblical name was Asnapper. 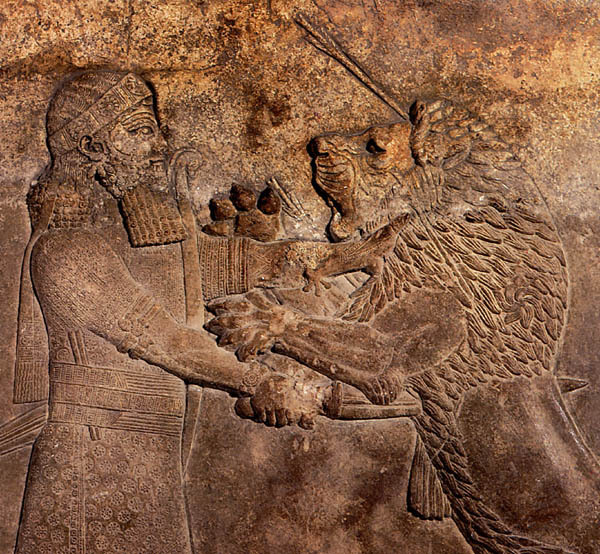 The panel was discovered at the site of ancient Nineveh during the reign of Ashurbanipal (668-626 BC). After shooting the lion with an arrow he thrusts a sword into its belly. The original is located at the British Museum in London. The alabaster relief is part of a panel standing over 25 inches tall. - The detailed relief stands 63.5 cm (25 inches) tall. 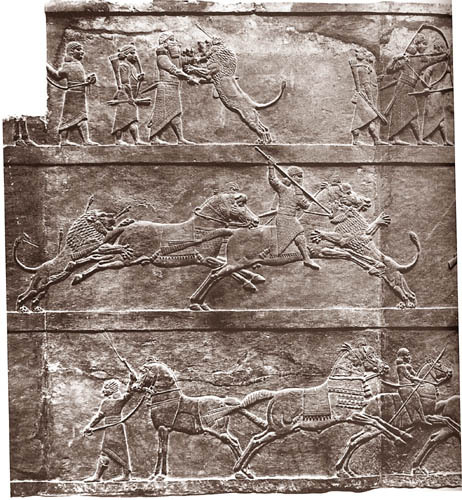 - The theme of the lion hunt was very popular in Neo-Assyrian royal art. - This stone panel was is currently at the British Museum.
" 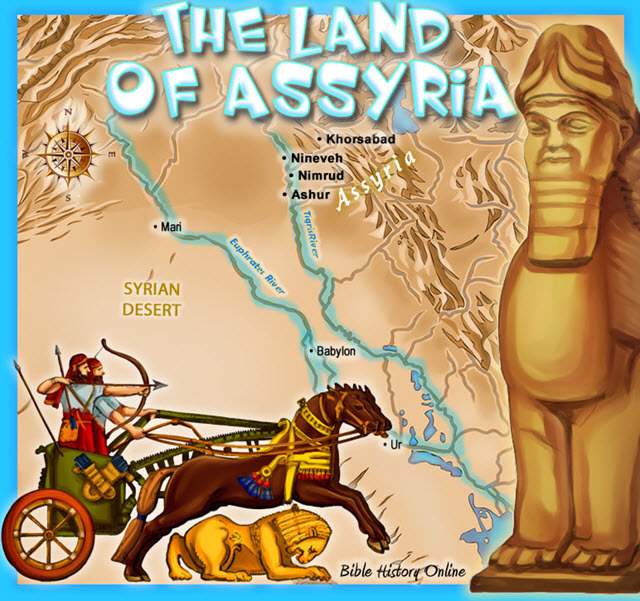 I am Ashur-bani-pal, king of hosts, king of Assyria. In my abounding, princely strength I seized a lion of the desert by his tail, and at the command of Enurta and Nergal, the gods who are my helpers, I smashed his skull with the axe in my hands." He goes on to say " I am Ashur-bani-pal, king of hosts, king of Assyria, whom Ashur and Belit have endowed with might. Against the lions that I slew I directed the powerful bow of Ishtar, the lady of battle, and I made an offering and poured out a libation over them." This is part of a series of sculptures which decorated a private gate chamber in the palace of King Ashurbanipal (reigned 669-630 BC). The scenes are arranged in three registers, and are similar to those on other relief panels fallen from an upper storey, and the large-scale versions in the corridor leading to the gatehouse. 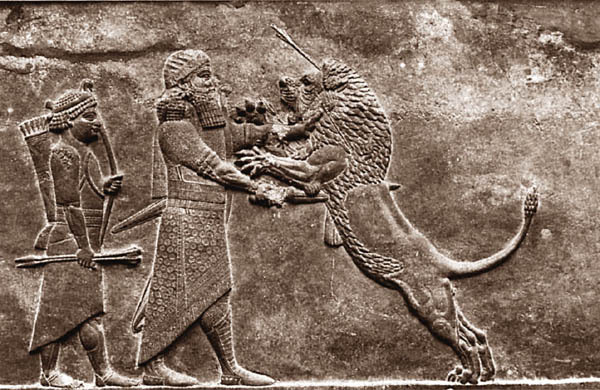 They often centre on lion-hunting; there was a close association between royalty and lions in ancient Mesopotamia. Unlike many of the reliefs, which act like a comic strip with the action moving in one direction, this one appears as a snapshot. Some of the gazelle, alarmed by a beater on the right, flee towards Ashurbanipal, who is hidden in a pit armed with bow and arrows. Herds of gazelle were once widespread in the Near East. They represented one of the main sources of meat for the people of the region. Ancient recipes survive for gazelle stew. Indeed, gazelle are said to have been common in Assyria as late as the 1950s though now they are only found in the remotest corners of Arabia. Modern firearms and motorized transport have almost driven these animals to extinction in this part of the world.